What is the certification process to import to Malaysia? 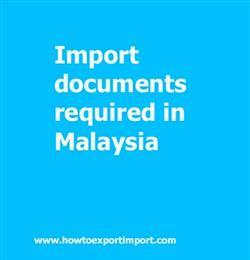 What are the documentation procedures as an importer in Malaysia? Types of documents required in Malaysia to import goods? Information provided here describes about documents required by each import in Malaysia which need to be submitted with customs officials for the clearance process. The documentation may vary depending on the country of origin or destination. Thus, documents may have to be prepared in a particular way to comply with the requirements of the import or export country. Understanding the right export documents is essential for smooth import and export procedures. The import documents required in Malaysia also depends up on the nature of goods importing (General goods, Personal effects, Dangerous goods, Livestock etc.) ,regular trade policy of Malaysia Government, specific goods importing to Malaysia (Arms and ammunition, health products, food products, chemicals etc.) and trade agreements with nations. This post explains about various documents that every importer need to be submitted with the Malaysia Customs Authority in order to obtain clearance of the consignment. Import documentation in TAWAU port customs. What are the documents required to import in TANJONG MANI. What are the import document processes need to carried out with SIBUc customs. Required documents to import in JOHARBAHRU port. Customs documentation requirements to import at PORT KELANG port. Documents required to submit with KOTA KINABALU customs for importation. Documentation procedures for import at PASIR GUDANG customs. What are the documents need to be submitted to import at JOHARBAHRU port customs. Which documents should I provide at KOTA KINABALU customs port location for import. Documents need to move cargo out of customs at Langkawi port customs location.